TIRANA, Albania (CNN) -- Albanian President Sali Berisha was to resume talks with political party leaders on Tuesday on a new national unity government as rebels tightened their grip on the south. Rebels took control of several more major towns on Monday including the ancient town of Berat, near Kucove, site of one of two big Albanian air force bases, and Permet, a remote mountain town. Insurgents also reportedly seized weapons from army garrisons around Fieri, 70 miles south of the capital Tirana, at dusk Monday and headed north. The latest areas to fall into rebel hands move the insurgency sparked by the collapse of pyramid savings schemes to within 55 miles (85 km) Tirana in the north. 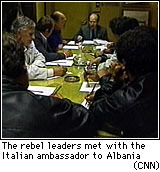 Late on Monday, Italy brokered a deal with rebel leaders in Vlora, the focal point of the rebellion. The rebels signed a declaration supporting last weekend's call for a new government and pledging to seek the surrender of weapons seized from army depots. 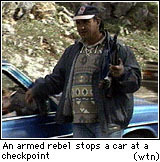 It was unclear, however, whether other rebel-held towns would follow Vlora's example. The southern port has organized itself under a rebel council headed by a former army general, while insurgents in some other towns appear to be operating without leaders. In Gjirokastar, another southern town, looters for the first time attacked government buildings, including the hospital, late Monday and early Tuesday. Witnesses reached by phone from Athens said hooded men stole large amounts of medicine from the hospital, which had recently received an aid shipment from Greece. In Tirana, Berisha met with opposition leaders into the early morning hours, negotiating the composition of a new government to lead the country until elections, to be held by June. The new prime minister will be from Berisha's Democratic Party and the new deputy prime minister will be a Socialist, but no decision was made on the key post of interior minister. The ministry's responsibilities include local councils and the police, both of which will play a key role in organizing new elections. Last year's elections, which gave Berisha 122 seats in the 140-member parliament, were boycotted by the opposition amid allegations of intimidation and vote-rigging, and were widely criticized by international observers.